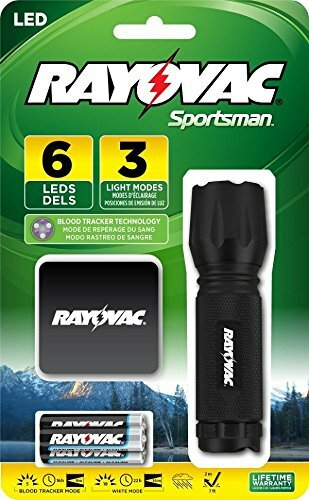 Home › Energy-Efficient LED Lighting › Rayovac Sportsman 18 Lumen 3Aaa 6-Led Blood Tracking Flashlight With Batterie..
Rayovac Sportsman 18 Lumen 3Aaa 6-Led Blood Tracking Flashlight With Batterie.. The flashlight that every hunter MUST have. The SPBT3AAA-B Rayovac 3-in-1 blood tracker flashlight comes with 3 modes (white LEDs, night vision, blood tracker). This light is perfect for tracking wild game or using in the woods to shine light on the trails when getting to your tree stand or hunting spot. This light comes with a holster making it easy to carry and store when not in use. Don't let that trophy buck pass you buy when you are tracking, search him out and find him with the SPBT3AAA-B. Lifetime warranty. Batteries included.